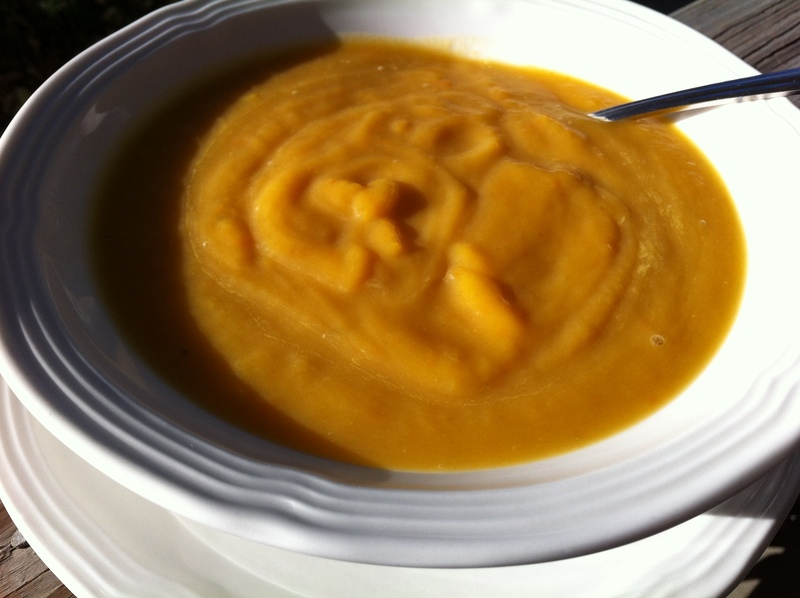 Our Butternut Squash and Roasted-Garlic Bisque is a rich, hearty soup perfect for lunch or as the starter at your next gathering. After Heather and I were married in 2000, we both wanted to find a way to celebrate the special people in our lives, to raise the bar beyond our usual dinner parties and bring in distinctive elements of color, candlelight, soft jazz and extra doses of deliciousness. Thus, our Fall Feast was born. Each November, we invite our most intimate friends to adorn themselves in beautiful attire, gather together, enjoy a libation or two and let us spoil them the best way we can, with our favorite culinary treasures. As we plan each year’s menu, we revisit recipes we made at previous feasts, such as this one for our Butternut Squash and Roasted-Garlic Bisque. A unique blend of aromatics, hearty vegetables, and rich cream, this thick soup has always been a beloved starter in our home. The first time we served it, guests asked if there was extra that they could take home, which is always a good sign and a compliment to the chefs. We know you’ll love this wonderful recipe too, and so will your guests if you decide to serve it at your next gathering. Preheat oven to 350°F. Rub cut surfaces of garlic with oil. Put halves back together to reassemble heads. Wrap each tightly in foil; bake until tender; about 40 minutes. Cool garlic in foil. Stir garlic into soup. Working in batches, puree soup in blender until smooth. Return to pot. (Can be made 1 day ahead. Refrigerate uncovered until cold. Cover and keep refrigerated. Bring to simmer before continuing.) Stir in 1/2 cup cream. Season to taste with salt and pepper. Transfer soup to tureen. Drizzle with remaining 1 tablespoon cream. Sprinkle with remaining 1 tablespoon sage.